Light, as far as fundamental issues in game design go, is an opaque topic for most gamers. In modern 3-D engines, it's something you simply can't have a level without - or, at least, one that doesn't involve a lot of bumping into walls. It's something that affects mood and functionality, acting as a supporting pillar for both the artistic and mechanistic elements of game design. But when implementing it, what is a designer really thinking about? To shed a little light on the matter, I talked to Jordan Thomas, best known as co-designer of the Cradle in Thief: Deadly Shadows. Recently, he's been working on a little game called BioShock. So, what exactly does lighting contribute to a level? "Artists and designers use light to help guide the player through the metaphorical 3-D space that represents the game world," Thomas says. "Now, I use the fancypants word for 'not literal' because, relative to the tiny miracle that is the human visual cortex, we're still very much in doodle territory, game-wise. ... Without light, the illusion of depth dissolves into a radioactive cardboard nightmare where everything shares the same solar glow. Most folks find that disorienting - y'know, if they have eyes." Beyond making a 3-D environment negotiable, lighting is also used to explain changes to the player and engage the emotions. "In the absence of their sibling senses - smell, touch and taste - sound and vision have had to grow up swiftly in the gaming space," Thomas says. "Essentially - lighting allows you to shout in subtext." In BioShock, he wants to use sound and light try to bypass the active critical mind of the player and go for the subconscious. "It's an old set of tricks, shamelessly employed all over the world by game developers, film crews, theater folks and even interior decorators. Imagine if we tried to tell the player, 'Please to be feeling empathy ... now!' with words, or even a thin veneer of fictional abstraction in the guise of scripted dialogue, when we're not even sure what he or she is looking at. It would come off as hokey, or worse, preachy. People are used to being 'sold to' by words. ... Light and sound are the hidden path into our hearts. They've got us surrounded." Lighting's uses and power have changed over time. Much of what interests Thomas was simply absent in early games. "I tend to be interested in games that stimulate a sense of fear using a sort of 'illumination economy,' or that involve light directly in gameplay as a force," he says. "In the 2-D era, there wasn't a lot of this, except in very deterministic adventure game vignettes. The closest thing that occurs to me in hindsight would be the omnipresent fog of war in the X-COM series - that sense of paranoia about what might be lurking outside the uncovered area." 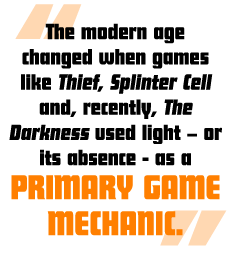 The modern age changed that when games like Thief, Splinter Cell and, recently, The Darkness used light - or its absence - as a primary game mechanic. "It's territory, and you have to conquer it, piece by piece," Thomas says. "In this case, dark is friendly, and light is hostile. And there's a certain sort of thrill you get to turning back and seeing all the shadow in your wake - as if by viewing your mission in time-lapse, it'd look like a big scary wave of fractal black, devouring the building." And as lighting improves, Thomas says new options are becoming available. "More recently, in the era of dynamic lights ... the obvious flashlight mechanic was born. It creates a sensation of panicky myopia. It invites you to genuinely notice your limited field of view again, with an imaginary assumption that if you're not directly looking at something, it's somehow faster and more dangerous. Active management of a light source had been done earlier than true dynamic lights, but until the shadows started leaping and shifting around you, it felt phoned-in."